What are the health benefits of alkaline water? Alkaline water is a hot topic in Australia, with many wellbeing advocates adding remineralised hydration to their recommended health regime to boost immunity and vitality. Alkaline water has higher levels of healthy minerals and has a higher pH level than regular drinking water. As a result, it may help to neutralise acid levels in the body and help to prevent various ailments. 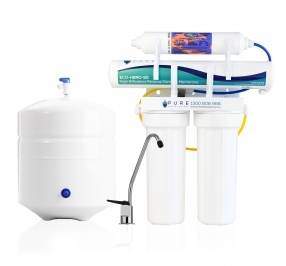 Request more information about our Reverse Osmosis Water Purification Systems today! Our market leading 4 Stage Reverse Osmosis Systems and Remineraliser adds essential minerals and raises the pH of your water to a level that is considered alkaline. Enjoy the highest quality, healthy drinking water all at the turn of your kitchen tap. Over 70% of the body is made out of water, which is used to distribute vitamins, minerals and glucose to nourish your cells... So it's important to drink the best quality! Alkaline water molecules are smaller and more easily absorbed by your cells, therefore can re-hydrate your cells more quickly. Daily consumption of acidic food and unclean water contributes to tipping your pH to the acidic end of the scale, which may promote illnesses and disease. Some advocates believe alkaline water can neutralise the acid in your body.